The Farewells-Litterbug EP. The Farewells are a Massachusetts husband/wife duo who produce some wonderful folk-infused indie pop a la The Pernice Brothers and The Autumn Defense, and they're back for the first time in nine years with the Litterbug EP. The gentle "Beehive" kicks things off with some "Because"-like harmonies, and the title track is a slow burner that will stick in your brain. But the real highlight here is "Nightlight", a buoyant pop tune that builds to an swelling chorus and has turned out to be one of my favorite tracks of 2011. 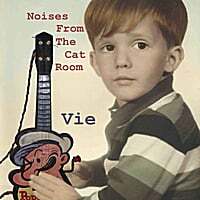 Vie-Noises from the Cat Room. Vie (not to be confused with Donnie Vie) is a California pop-rocker with a sophisticated pop sound not unlike artists such as Linus of Hollywood, Ken Sharp and Neil Traynor. "Oh Carly" is a power pop nugget with some fine guitar work, and the acoustic guitar-heavy based "Oh Christine" is another winner (he even throws in a cover of Cheap Trick's "Oh Caroline" to complete the "Oh-girl's-name-that-starts-with-C" trilogy). The Beatlesque piano ballad "My Love" shows his facility with the slower stuff, and the strings and harmony vocals give "Anyway" a melodic urgency. Vie says he's been writing these songs for 14 years, and it was worth the wait as just about every track has something to recommend it. It's overlooked gems like these that keep me looking. Thanks for so many discoveries.